In the mood to do a little baking for Valentine’s Day? Maybe you want to make a special treat for yourself to help unwind the week? 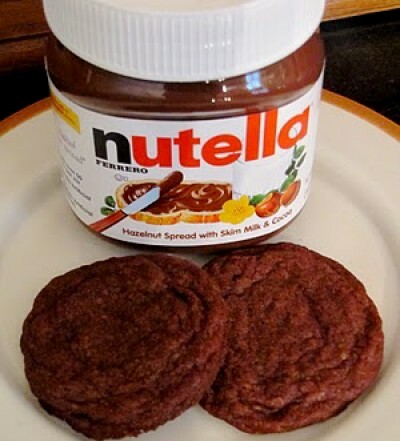 If you’re a Nutella NUT like I am, try these cookies out! 1. Whisk together flour, cocoa powder, baking powder, baking soda and salt, and set aside. 2. Combine butter, granulated sugar, and brown sugar in a large bowl; beat with an electric mixer on medium speed until creamy. 3. Add chocolate hazelnut spread and vanilla; mix until combined. 4. Add half of flour mixture, then milk, and remaining flour mixture, stirring well between additions. 6. Refrigerate dough at least 20 minutes. 7. Preheat oven to 325°F. Using a tablespoon measure, scoop dough onto baking sheets lined with parchment paper. 8. Bake 8-10 minutes, or until set but still soft. 9. Cool on baking sheets 2 minutes; transfer to wire racks and cool completely.